I apologize for the long absence, dear readers. Business of a fairly mundane nature called me away from the city, but I have returned. The snows have begun and I am afraid I have captured little of interest since we last spoke. Instead, I have dug into my archives and found an image that represents a phenomenon that you will find scientifically stimulating. Like the common gray squirrel of the 1st and 2nd worlds, many species of faery will build nests of leaves and other detritus in which to pass the time of the colder months, waiting for the world to grow warm again. Most faery species have no tolerance at all for the cold. It is my personal theory that the climate of the City Park has changed recently on a geologically recent time scale. We have evidence of the beginnings of many cold weather adaptations in the species I study, but most simply hibernate, which I suspect is a relatively easy trait selected for in cold-intolerant species. The above photonic capture is a typical wintering nest, found in the shrubs near a small brook that bisects the eastern side of the Park. The bare limbs of trees and plants expose these nests everywhere, and they are a quite common site. I often wonder if owls or hawks, or even the mink sometimes seen near the banks of the stream make meals of the hibernating faeries. I have dissected a number of nests. 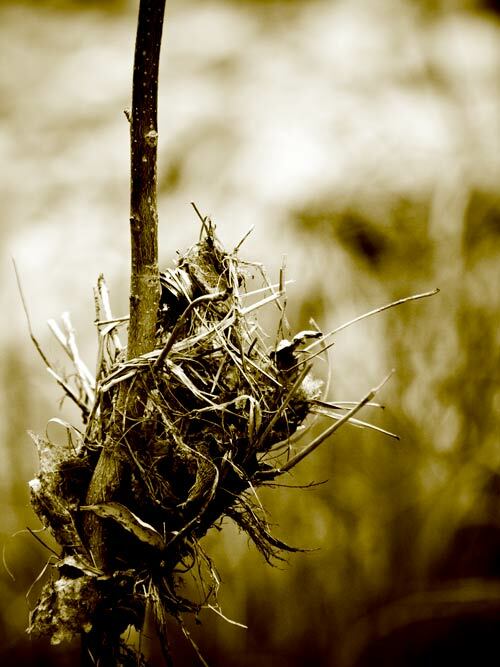 The faeries within the nests will die when exposed to the cold, but if one brings a nest indoors and subjects to them to warming, the faery will, within 24 to 48 hours, leave torpor and behave as if the spring has arrived.